Foodies, get your forks ready! It’s almost time for Vegas Uncork’d by Bon Appétit. The annual event, which features the world’s best chefs, sommeliers and mixologists, celebrates its 10th anniversary this year. If you love good food you’ll want to be in Vegas April 28 – May 1 for the parties, tastings and events with chefs like Giada De Laurentiis, Emeril Lagasse, Michael Chow, Guy Savoy, Gordon Ramsay, Nobu Matsuhisa and Jean-Georges Vongerichten. For the first time, Vegas Uncork’d will be heading to downtown Las Vegas this year with parties including a Steakhouse Redux at the iconic Golden Steer featuring Michael Mina. This year’s event will also feature a Mystery Dinner hosted by Emeril Lagasse, at a location that has yet to be announced. 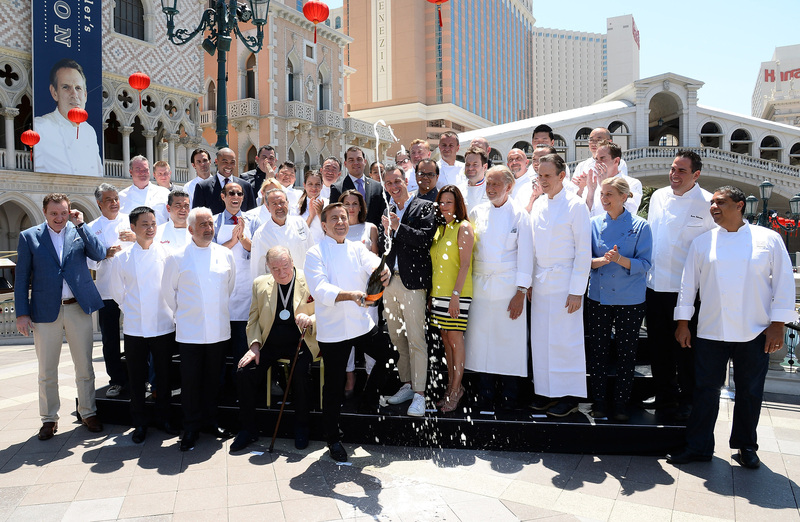 Dozens of celebrity chefs celebrate the Vegas Uncork’d by Bon Appétit culinary festival. Photo by Ethan Miller/Getty Images for Vegas Uncork’d by Bon Appétit. Master Series: Nobu Matsuhisa’s Ultimate Omakase (Caesars Palace), Thursday, April 28: At $1000 per person, this once-in-a-lifetime event with Nobu Matsuhisa, is a multicourse experience, with the master chef hand crafting each dish in this selection of omakase. Net proceeds of this event’s ticket sales will be donated to the ‘Keep Memory Alive’ organization. Master Series: A Decade of Indulgence with Guy Savoy (Caesars Palace), Thursday, April 28: In celebration of both Restaurant Guy Savoy’s 10th anniversary at Caesars Palace, and the 10th Anniversary of Vegas Uncork’d, the Michelin-starred chef will present a five-course epicurean affair with premier pairings including prestigious selections of Krug Champagne. The Grand Tasting event at Caesars Palace, photo by Ethan Miller/Getty Images for Vegas Uncork’d by Bon Appétit. 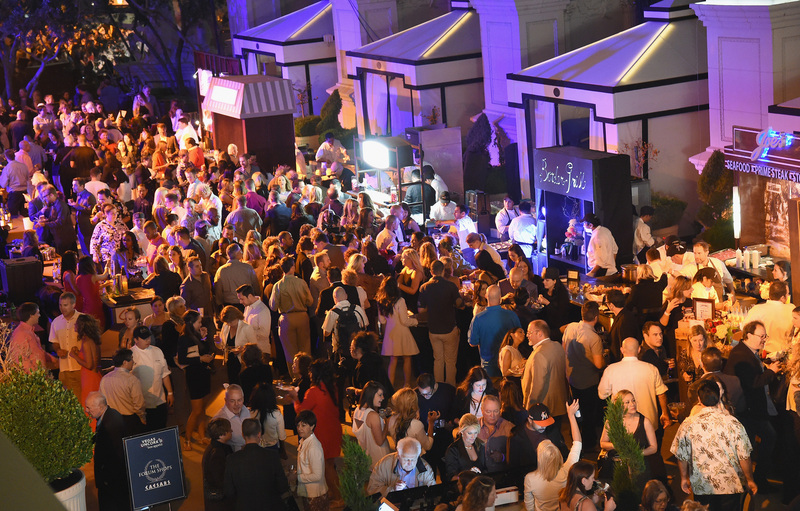 Grand Tasting (Caesars Palace), Friday, April 29: The Grand Tasting is the granddaddy of Uncork’d events. It will feature signature dishes from more than 50 renowned chefs, free-flowing wines, and spirits from around the world. Set against the backdrop of the Garden of the Gods Pool Oasis at Caesars Palace, The Grand Tasting is the opportunity to meet and learn from the world’s most respected culinary figures, while sampling uniquely curated and expertly crafted tastes. Dine in the Dark: A Sensory Lunch at Bacchanal Buffet (Caesars Palace), Friday, April 29: Think you’d appreciate your food more if you couldn’t see it? Guests will be blindfolded at this event, then led to their gourmet multicourse lunch in a private dining room. The special tasting menu will highlight some of the Bacchanal Buffet’s signature dishes and feature enhanced textures, smells, and sounds. BA Navigator Downtown Tour (Downtown Container Park), Saturday, April 30: This event takes guests downtown for a diverse lineup of four restaurants and bars. Led personally by a Bon Appétit editor, you’ll sip and sample delicious bites from a curated menu at each of the night’s stops, and interact with the chefs and restaurateurs. Brunch at GIADA: An Italian Inspired Feast (The Cromwell), Saturday, April 30: Join chef Giada De Laurentiis for brunch at her namesake restaurant. Guests will indulge in GIADA’s new brunch menu, highlighting her California-inspired Italian cuisine, and enjoy limitless mimosas and more. The Ultimate Comforts & Classics Affair (Downtown Container Park), Saturday, April 30: The best of birds, bubbles and burgers will come together at the Downtown Container Park for an evening filled with comfort food, flowing drinks, and live music. This event will take over the hip locale’s lawn, where some of the best local restaurants grill and fry up their specialties. Guests can sample bites including Shake Shack’s limited edition crackle burger and the one-night-only Vegas Uncork’d Concrete, made for this event as well as signature dishes from Yardbird Southern Table & Bar and their new fast casual concept Spring Chicken. Master Series: Pastry Savvy with François Payard (Caesars Palace), Saturday, April 30: Join one of the world’s most renowned pastry chefs, François Payard, at Payard Pâtisserie & Bistro, for a behind-the-scenes master class in technique and how to create phenomenally fresh, and delicious French pastries. Brunch & Bubbles at the Boss’ House (The Venetian), Saturday, April 30: Enjoy brunch at Buddy V’s Ristorante at The Venetian. Hosted by “Cake Boss” Buddy Valastro’s operating partners, Chef Kim Canteenwalla and restaurateur Elizabeth Blau, of CNBC’s “Restaurant Startup,” the brunch will feature classic favorites, complemented by elaborate seafood stations, a caviar ice bar, bottomless bubbles, build-your-own Bloody Mary bar, a decadent dessert display and more. Eye Openers & Eats: Cocktail Academy to Brunch with Hubert Keller, Rick Moonen, and Salvatore Calabrese (Southern Wine & Spirits Cocktail Academy) Sunday, May 1: It’s Sunday morning, and time to sip on some delicious cocktails and indulge in a decadent brunch to wrap up the weekend in Vegas. Hosted in a state-of-the-art beverage training facility, you’ll get an insider experience since this location is not usually open to non-industry guests. Participate in hands-on cocktail demos by two of the world’s best bartenders; “The Maestro” Salvatore Calabrese, and Francesco Lafranconi, Southern Wine and Spirits executive director of Mixology & Spirits Education. During brunch, you’ll be treated to top notch wine, spirits and food prepared by Hubert Keller and Rick Moonen. Tickets for Vegas Uncork’d by Bon Appétit are on sale now and can be purchased at http://vegasuncorked.com/.